In a two-week poll we asked Bigfoot Lunch Club fans which websites they visited most. Kentucky Bigfoot came out on top. There are two good reasons why Kentucky Bigfoot topped our list. 1) Kentucky is a hotspot. The much anticipated Erickson Project has claimed to have convincing evidence from Kentucky. Plus, Kentucky will be showcased in two shows this coming TV season; Finding Bigfoot and Only in America with Larry the Cable Guy. 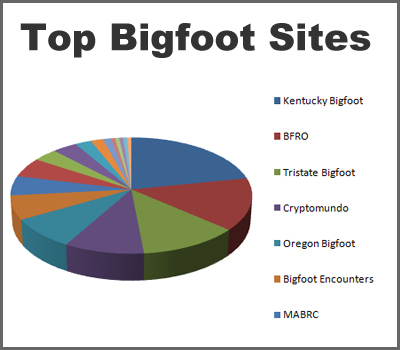 2) The second and larger reason for Kentucky Bigfoot topping the list is the Organization itself. They are as authentic as researchers can be, extremely organized and they reach out to their audience. They are inclusive and share their research publicly. Their self-described purpose, "...is to obtain 'one' database as to monitor population density and migration patterns for all reported Kentucky Bigfoot encounters. To determine authenticity, credit is given to each source and witnesses are contacted whenever possible. The information contained therein is being used solely for research and educational purposes. Lead by Charlie Raymond, a high school teacher and IT Specialist. Charlie holds a bachelor's degree in psychology from the University of Florida. 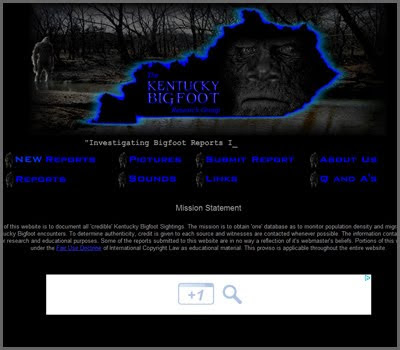 He developed this website to document all credible bigfoot encounters in Kentucky. He believes bigfoot to be a "flesh and blood" unidentified hominid, VERY closely related to us. Out of 165 voters we ended up with 18 listings the top ten list is below. The pie chart below shows the percentages of the votes with Kentucky Bigfoot commanding 22% of the votes. Our hats are off to Kentucky Bigfoot, we salute your contribution to bigfooting. Haha. I'm guessing Kentuckians have a little vested interest in that poll. I would expect that from the people at the kentucky bigfoot web site. I have meet them and was not impressed. No kidding Autumn, they definitely rallied their fan base to get the votes. Which speaks to the relationship and loyalty of their fans. However, I think the top-ten list is a pretty good show case for high quality sites. Honestly, I like mine better. :) All of our own evidence all the time. Check out our new Bigfoot photo with prints. The head is in the "y" of the tree and check out foot with black toe nails similar to gorilla in color. :) Mike J-Sasquatch Investigations of the Rockies. FB FB.Is my favorite site you learn How and Why,,they are my choice.